Not all horses can go barefoot, how­ever. 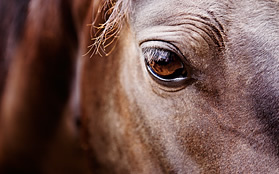 To know whether your horse is a good candidate, you need to consider several factors. These include weather and climate (moist conditions make feet softer while a dry climate makes them harder), footing issues (whether the horse lives on soft footing or a rocky pasture), use of the horse and its indi­vidual foot strength. To keep equine feet “natural” (healthy and strong while barefoot), environment and lifestyle must also be kept more natural. The barefoot life won’t work for a horse that lives in a stall or small pen, soft grassy pasture or wet conditions. This is especially true if you then ride your horse on gravel roads or rocky terrain. The horse will quickly become tender-footed or go lame from stone bruising. 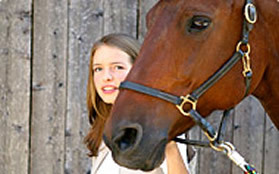 To be ridden without shoes, the horse’s feet must toughen up by living in the same terrain you ride in. If it’s in a dry climate in a big rocky pasture, the horse will tend to have hard, strong feet. If it’s in a soft, wet pasture or a wet climate, its hooves will be soft and wear away quickly if ridden on hard, rocky ground. Feral horses gathered from public lands in the arid West can handle aver­age riding stresses without shoes. But if you take them to a wetter climate, their feet become softer, just like any other horse. Conversely, you can take a soft-footed Eastern horse to a drier climate with rocky footing and its feet will gradually become harder. A horse’s use will dictate whether or not it can go barefoot. 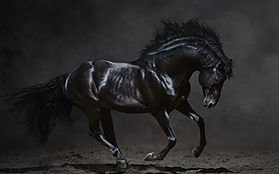 A horse doing long rides in rocky terrain can’t withstand these stresses without shoes unless it lives in this environment and its feet are very tough. Even then, if ridden daily in the rocks for long dis­tances, the feet may wear faster than they grow and eventually need shoes. The final factor is hoof structure. Some horses have better, stronger feet than others, regardless of environment. Hoof-capsule strength and integrity is partly due to genetics. Proper nutrition can help some horses grow stronger feet, but others will always tend to have shelly, thin hoof walls and soles. They cannot withstand the stress of athletic work without shoes. Some horses with hoof problems need shoes even if they aren’t ridden — to protect the feet and help hold their shape and integrity. One option if you want to keep your horse’s feet barefoot is to use hoof boots when riding. If you don’t have ideal conditions for your horse’s feet and they cannot stay tough enough for riding, find a hoof boot that can keep feet from bruising or becoming tender. If your horse has always had shoes and you decide to try him barefoot (after determining he might be a good candidate), you can aid this transition by planning ahead. It takes time to toughen feet after wearing shoes. If you generally have your farrier pull shoes off in late fall to let your horse go barefoot through winter, it’s not difficult to transition into staying barefoot in spring — since the feet had all winter to toughen up. The hooves just need trimming and smoothing to remove any flares or long growth. Your farrier can do a “barefoot trim” instead of trimming off all the extra hoof growth like he or she would to prepare for a shoe. A barefoot horse needs some extra hoof wall, but your farrier will smooth the edges so they are less apt to chip and split when the horse is ridden on rocky ground or gravel roads. If a horse has been shod all its life and you want to transition to barefoot, do it gradually. Don’t just take his shoes off and ride. That would be like you trying to go barefoot after wearing shoes all winter. A big factor in whether a horse can handle being barefoot is whether his feet are short and well balanced. The farrier should know where the break­over should be in the natural barefoot hoof, where the heels need to be for good support and remove any unnatu­ral flare in the hoof wall. Otherwise the feet will split and break. The horse must have a sound and balanced foot to start with, before you can expect him to go barefoot and keep a healthy foot. When you first start riding the horse without shoes, do it gradually — with short rides — and don’t start out on a gravel road. Gradually adjust to more distance and abrasive footing. If you must do a longer ride in the rocks before the feet are fully toughened, use hoof boots for protection.